Stopping robocalls is not an easy problem to solve on your own. Robocalls are the worst. It is something we can all agree on. Whether you have been a target of robocalls for some time, or just started receiving them, it does not take long for you to want to throw your phone out of a window. Robocalls are not only annoying, they are a massive threat to the security of your personal information, money, and time. In the past, it has been difficult to stop the flood of the 2.9 Billion spam calls Americans receive on their smartphones per month. Legal vs. Illegal Robocalls: What’s the Difference? What Laws Protect You from Robocalls? A robocall is one of many types of phone calls that are considered spam. Spam can be defined as irrelevant or inappropriate messages sent to a large number of recipients – typically who have not expressed interest in receiving the message. Robocalls differ from most spam & telemarketing calls primarily because they are auto-dialed from a computer and deliver a prerecorded message. Robocalls are often designed to enable interaction from the recipient, either through voice or keypad input or through transfer to an agent or representative. Though some types of robocalls, such as political robocalls, are legitimate calls and legally approved by the FTC, the unfortunate reality is that most robocalls are either illegal, fraudulent, or both. Those who place illegal robocalls pose a danger to all consumers nationwide because they have no regard for the law or your well being, and will stop at absolutely nothing to steal from you. It is important to understand the difference between a legal and an illegal robocall, because legitimate companies are allowed by law to send robocalls to consumers’ cellular & landline phone numbers under some conditions. In the next section of our post, we will cover the differences between legal robocalls and illegal robocalls. In very few circumstances, robocalls can be helpful to provide important notifications you might otherwise miss. A few examples include flight or school cancellations, appointment reminders, and credit card fraud alerts. The FTC has placed heavy restrictions and limitations to protect consumers from unwanted robocalls, otherwise, offenders face heavy fines. Federal law requires all telephone calls using pre-recorded messages to identify who is initiating the calls and include a telephone number or address whereby the caller can be reached. In most instances, legal consent or “opt-in” is also required to place pre-recorded telephone calls to landline and mobile phones. Federal Law also requires legal & legitimate robocallers to honor phone numbers listed on the National Do Not Call Registry. The National Do Not Call Registry is a list of numbers submitted by consumers that do not wish to be contacted from legal telemarketing and robocalls. Companies must purchase this list before sending these calls, otherwise, they will face hefty fines. The only time a robocall can be placed without opt-in consent is when the robocall contains updates necessary to the recipient, such as a flight cancellation or a fraud alert from credit cardholder services. Prior consent is not required to place a robocall to your smartphone. Illegal robocalls are very dangerous because they have no regard for any communication laws put in place by the government through the FTC or FCC. No illegal robocaller is ever going to register with the government or buy into the Do Not Call List to place calls that are fraudulent by design – because they are very much aware that what they’re doing is against the law. Lack of prior consent is what makes a robocall illegal. If you have not consented to receive a robocall and the robocall does not contain emergency or need-to-know information, the robocall is illegal. At times, these are legally registered companies misinterpreting the law either intentionally or mistakenly. If caught by the Commission, these organizations face heavy fines, penalties, and negative press for abusing robocalling rights. Though you may hear about large organizations getting caught sending illegal robocalls, the reality is that these situations are few and far between. Roughly 90% of illegal robocalls are also fraudulent by nature, and do not come from legitimate organizations “mistakenly” placing illegal robocalls. Most times, these callers are scam artists from all over the world, making them more of a threat to you as they are not held to FCC rules and regulations, and next to impossible to track. There are many ways that your phone number can become a target of robocalls, but it is also very likely that your number was auto-dialed at random. Though it is possible that your information may have been scraped from the internet, in many instances, there is no method to the madness – your phone number is dialed at random. Using auto-dialing technology, spam calls can be placed in immense volume with little strategy or method to the phone numbers called. In these circumstances, the first call to the phone number is typically placed only to identify if it is an active phone number. If the caller is unsuccessful in scamming or selling their product to the victim during their first attempt, the phone number will be flagged as “try again”. This could be due to the call recipient engaging with the caller, dialing a number to “opt out”, or requesting to no longer be called. This, in turn, will increase the number of spam calls you receive – simply because the spam caller knows they’re under your skin. For this reason, it is important to avoid answering or engaging with unfamiliar calls as frequently as possible. Telephone Consumer Protection Act (TCPA) places restrictions on robo calls and prerecorded messages made by telemarketers, businesses, debt collectors, and political campaigns. Robocalls to phone numbers on the “Do Not Call Registry” are considered an immediate violation of the law. The Do Not Call Registry is a national list of phone numbers listed consumers of which do not wish to be called by telemarketers. The TCPA prohibits any solicitations calls to those consumers whose telephone numbers are registered on the Do-Not-Call List. Consumers can place both their cell phone and residential lines on the Do-Not-Call registry. If the consumer has done business with a telemarketer/seller within the last 18 months or made inquiry within the last three months, then it is presumed under the TCPA that the consumer has an established business relationship with that telemarketer/seller. The TCPA prohibits the use of robocalls or spam text messages to both personal and professional cell telephones. A robocaller violates the law every time they make an automated robo call or text message to a consumer’s cell phone without consent. The only circumstance of which does not violate the TCPA is if the consumer previously gave the robocaller permission to call. In cases where consent has been previously given, the consumer can revoke that consent by notifying the telemarketer or debt collector to stop calling the cell phone. As you’ve now learned or may have already experienced, there are many different types of robo calls. Though some robocalls have the intention of being helpful or informational; The reality is that most are not. Robocalls distract us from our families and friends, interrupt productive work days, and worst of all, try to steal our money or personal identity. More and more, we become less trustworthy of unfamiliar numbers calling due to the growing robocall issue. As a result, we miss important updates from callers with good intentions, such as schools, doctors, & job offers. Taking the time to learn how to stop robocalls the right way will truly make your life better. It will exponentially reduce your risk of telephone scams, save precious time wasted answering unwanted or illegal robocalls, and restore your confidence when answering incoming calls. There are a few reasons why stopping robocalls are challenging. In the next section of the post, we will highlight the major challenges in stopping robocalls effectively and why understanding the limitations of most robocall blocking solutions can be helpful in identifying the true solution to the problem. Caller ID spoofing is arguably the biggest challenge in fighting robocalls and is primarily to blame for the growing spam call issue worldwide. Illegal robocallers utilize Caller ID spoofing because it is incredibly difficult to trace. This makes them confident they can commit phone crimes without getting caught. Even the Recipient’s Phone Number! Caller ID spoofing allows spam callers to be more strategic in their methods to get you on the phone. Spoofing allows spam callers to place calls from phone numbers that appear to be in your same area code, to make recipients believe they are receiving a call from their doctor’s office, mechanic, or school. The economics of Caller ID spoofed robocalls also makes phone scamming an attractive market. All that truly needed to scam unsuspecting victims from their hard earned money is a telephone and an auto-dialing service – the barriers to entry are quite low. It is also speculated that it costs a robocaller anywhere from $0.01 to $0.05 per minute to place a spoofed call. That is pretty cheap when you consider the potential reward of millions of dollars fraudulently collected by these crooks! What makes Caller ID spoofing so challenging to stop? Because each spoofed call can be placed from a unique fake number, robocalls are close to impossible to trace to the true origin of the caller or stop the caller from calling you again. As the technology designed to help robocallers reach your phone has evolved, effective smartphone call blocking has not. This is partly because of common misconceptions about effective robocall blocking solutions, and partly because phone and service providers have yet to invest in developing functionality that will help stop the problem. In the next section of our post, some common solutions to stopping robocalls and reasons why they don’t work. When the Do Not Call Registry was launched in 2003 it became a huge media story, but unfortunately, the story did not line up with what was actually being offered. The Do Not Call Registry is a list of people that have opted out of telephone solicitations from legal, registered businesses. Legal businesses are required to honor this list. In fact, they have to purchase access to this list if they want to sell their services by telephone. And they do! Legal, registered businesses honor the Do Not Call Registry every day, but the call that interrupted your dinner last night wasn’t from a legal, registered business, and the Do Not Call registry cannot and will not protect you from those calls – ever. While registering on the Do Not Call List will definitely reduce the number of legal spam calls from reaching your phone, it definitely will not stop the illegal robocallers. This is primarily because illegal phone criminals will never register on the Do Not Call Registry to try to steal from you over the phone. These callers are the ones you should really be concerned about, as they have no regard for the law or your safety & well-being. A) Not going to register their “businesses” — When you are a crook, it is a terrible idea to tell a government agency that you are crook and you plan to steal from people. C) Hiding in the shadows — You can’t shut down their phone numbers because they will just use another “spoofed” number, you can’t arrest them because they live in foreign countries and are nearly impossible to find, and you can’t expect the government to just make it stop because if it was that easy they certainly would. While we do recommend registering on the Do Not Call List if you wish not to receive legal telemarketing calls, we do not recommend you rely on the Do Not Call List as the all-encompassing solution to the dangers of illegal scammers & robocallers. The Do Not Call Registry was not designed to stop spammers who have no regard for the law – nor will it ever have the technological resources to do so. Filing a report with the FTC can be helpful in identifying common trends of scam artists and preventing other victims from losing their hard earned dollars. However, the unfortunate truth is that the Commission simply does not, and likely will not, have the advanced technological resources to reveal the true identity behind these spoofed calls and stop them from calling you. Because of this, the Commission recommends downloading a third party spam call blocking app such as TrapCall to protect yourself from the risk of phone scams. Phone spoofing also makes using the call blocking features built into your mobile phone obsolete in the fight against robocalls. There is one major problem with this recommended solution. Using the “Block This Number” function on your iPhone or Android will not fight the number of unwanted robocalls you receive. If the robocaller discovers there is another person on the other end of the phone and your number is flagged as “try again later”, you’ve only made matters worse. Robocallers will increase their attempts to get you on the phone – each time from a different fake number. Money. 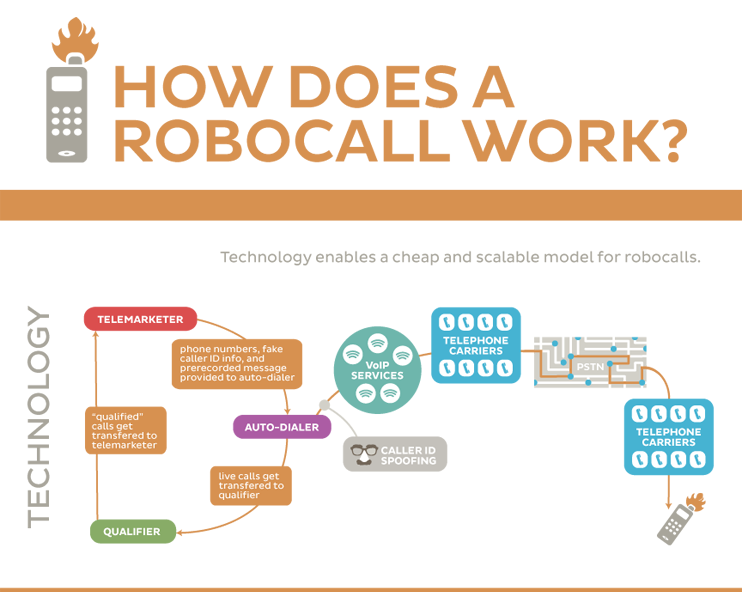 Understanding the economics of robocalls is the first step in solving the problem. Placing phone calls is inexpensive for telemarketers and robocallers; they can make millions of illegal calls at little cost and with almost no risk. Unfortunately, phone companies make money when they connect these calls to your phone. So unless their competitors are offering a better solution to stop nuisance calls, carriers have little incentive and money to lose by investing money to prevent these calls. Regulations. Telecommunications is highly regulated by the government to create competition and fairness, but this also slows down innovation and reduces the risks carriers are willing to take. Apps such as RoboKiller Exist. Because there are well-known apps who have already mastered the trade of advanced call blocking, there is no need for phone carriers to invest heavily in technology to block robocalls. New laws and new cooperation between the government, telecom companies, and third-party providers are hoping to improve the telemarketing and robocall situation, but it’s unlikely to happen anytime soon. The concept of an effective robocall blocking app is simple – if spam callers can’t ever reach your phone, they can’t steal your time, money, or personal identity. Not to mention, they are created by people who hate spam calls so much that they dedicated years to designing an app that will effectively stop spam calls for good. To summarize, robocall blocker apps are an excellent solution to your robocall problem. Their benefits range anywhere from saving the hassle of changing your phone number, getting revenge on the scammer who stole your time, money, or personal identity, to always knowing who is calling. However, if you are looking for a more extensive set of tools to fight phone harassment, call blocker apps such as TrapCall are a much better solution to your problem. It may seem biased, but we know through experience that downloading a robocall blocker app is the only solution to equip you with the tools you need to protect yourself from the dangers of phone scams & fraud. 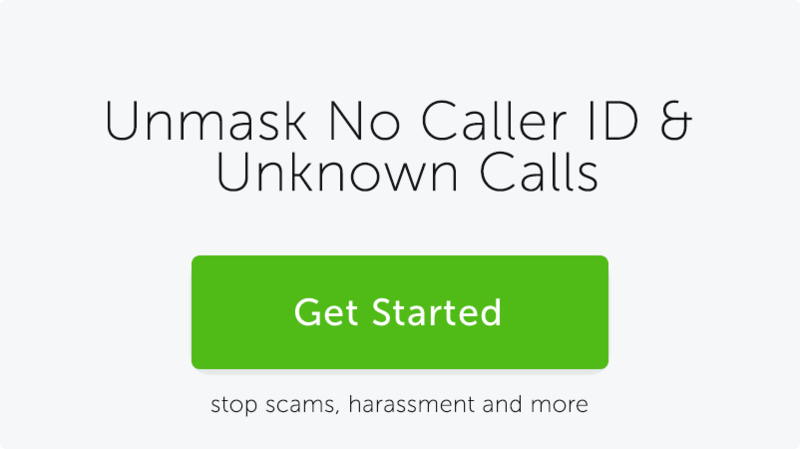 Robocall blocker apps are truly the anti-virus for your smartphone phone calls. We recommend you and your loved ones download one today!